OMS uses laser welding technology implemented by two world-renowned companies. TRUMPF provided a solid-state crystal YAG laser with a 1 kW power rating and KUKA installed a complementary six-axis HRC welding robot and positioning workbench with two workstations and pneumatic fastening. This configuration enables us to weld in an uninterrupted cycle – the robot welds in one workplace, while the operator positions a new part in another workplace. In contrast to conventional MIG/TIG welding, the laser device enables us to reach an incomparable quality of the weld itself and of the welded part’s surface. As we weld sheets with a thickness of 0.6 mm, the benefits are apparent in terms of both quality and quantity. Within an average of 2.5 minutes, we are able to prepare the CLASSIC ASN welded housing with no need to perform additional abrasion operations. In addition, the part is ready immediately for surface treatment. 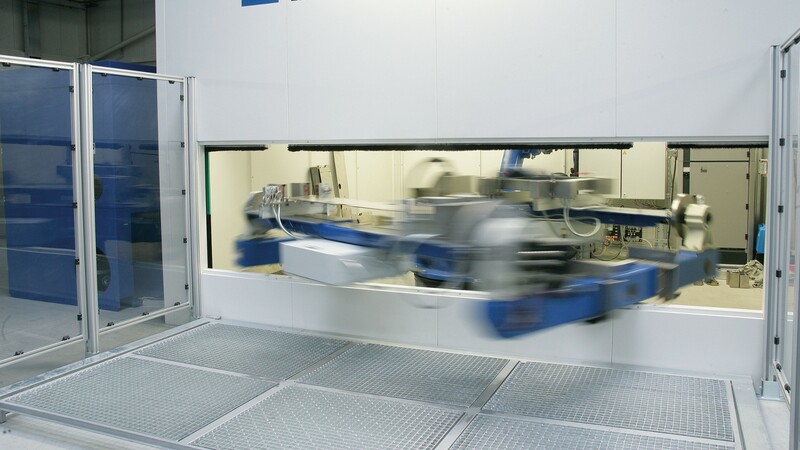 Since laser beams are extremely dangerous to the human eye, the entire welding process takes place in an enclosed cell where only the six-axis welding robot is located. The laser device is located outside and the beam runs through an optical cable directly to the welding robot, which points the beam in the welding head (a set of lenses) to be focused as required.